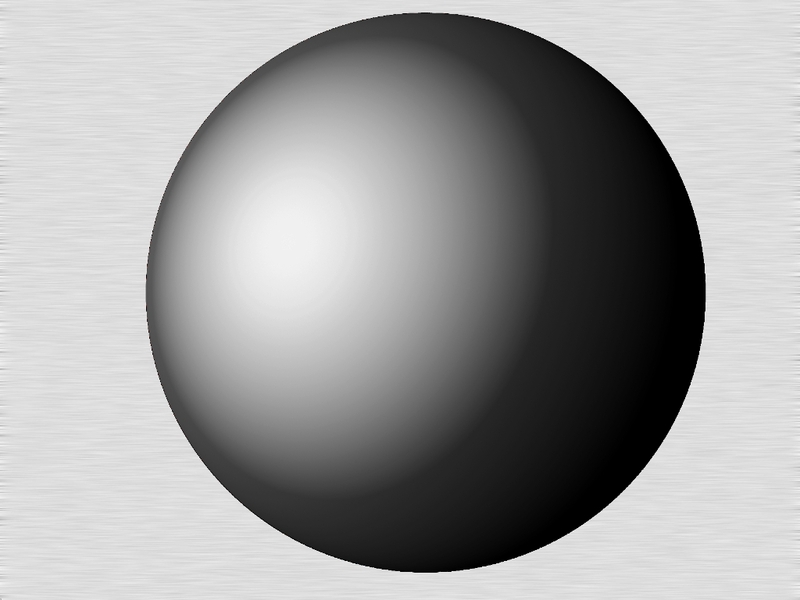 In his Physics, Aristotle proposed that there were five elements, the four Empedoclean elements along with aether, the element that makes the heavenly spheres and bodies of the Pythagoreans. This is not to be confused with Anaximander’s apeiron, the infinite out of which all things are composed. Beneath the aether, under the moon which travels in the lunar sphere, are fire, which is hot and dry, air, which is hot and wet, water, earth, which is cold and dry, and water, which is cold and wet. As things tend to seek their natural places, water tends to move downward and fire tends to move upward. All of this we had with Empedocles earlier. Like Plato, his teacher, Aristotle relied on the thinking of many previous philosophers in critically creating his system. 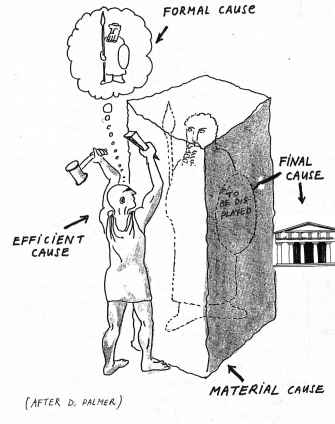 Aristotle argued that each and every thing is the result of four types of cause. The first two are the form of the thing and the material of the thing, what a thing is and what it is made of. The second two are the efficient cause, from what the thing originates, and the final cause, the purpose of a thing, where it terminates. Aristotle, like many of the ancient world, believed in a teleological universe, and that things are given their form with a purpose. Notice that, just like we find in Plato’s Timaeus, things are created from ideas, the idea made of a higher element than the material in which the form is intentionally crafted. 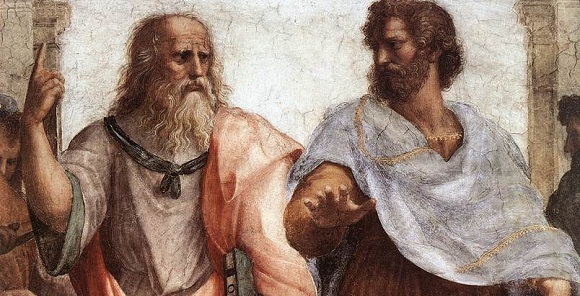 While some have called Aristotle a materialist, like Plato he believed that the idea and form of a thing is superior to the crude material, but unlike Plato he put emphasis on the lower, material part of things as also essential to what they are, famously captured in the center of the School of Athens painting by Rafael with Plato pointing to the heavens and Aristotle putting his hand over the earth below. If we could hear Aristotle talk, he would be telling Plato that material is the body of form, which is the mind, inferior but also important. Like Plato, Aristotle believed that the form or idea of a thing was its higher essence and being. The material out of which it was composed was temporary, less defined and definite as the form. 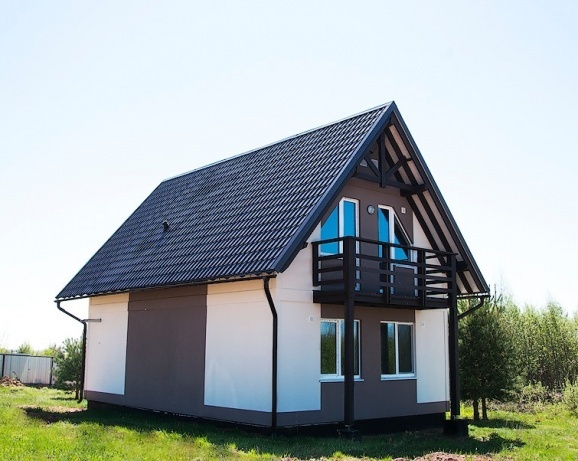 For instance, if we build a building, our idea of the building’s form is more durable than the material, no matter how strong, out of which we build the building. 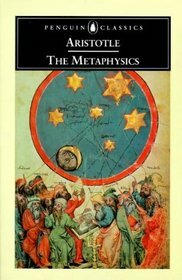 “Metaphysics” meant for Aristotle “after physics” or “beyond physics”, the subject or book that follows physics. 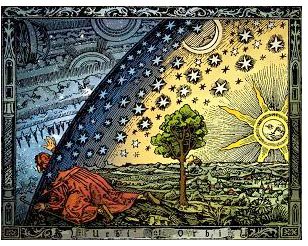 Today, the term is understood as “over physics”, the rules behind reality or laws of nature, as Aristotle continued after teaching physics to explain the physics of physics, the overarching laws of the universe from which nature is created. In modern European thought, both the skeptical Continental tradition of Germany and France and the Analytic tradition of Britain and America have sought to abolish metaphysics, the Continental tradition because they are cynical of human conceptions, the Analytic tradition because of faith in the continued use of the scientific method. 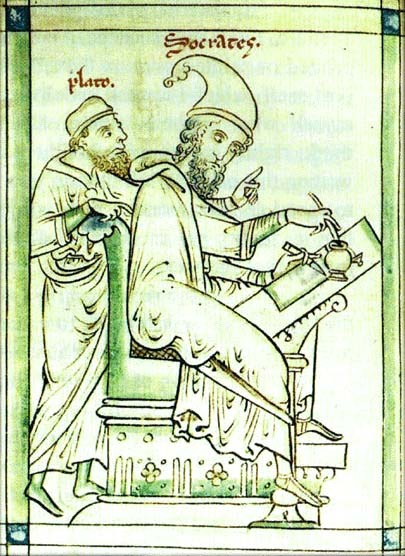 Aristotle begins his Metaphysics by reviewing the history of Greek philosophy, saying that the Milesians were the first Greeks to study nature, and the Pythagoreans were the first to excel at mathematics. For Aristotle, the Eleatics were the first to do “pure thought”, pushing thought to its most abstract, as we saw last week in Plato’s dazzling dialogue the Parmenides, and Aristotle also gives credit to Anaxagoras. However, it is Socrates who Aristotle considers to have reached the pinnacle of thought and set out a method for using analogy and induction to find the general and universal definitions of things. Clearly, Aristotle believed his teacher Plato’s dialogues to be accurate, and it was Socrates as Plato’s character, Plato himself, who Aristotle admired so highly. Even as Aristotle disagreed with Plato on the subject of form, saying that forms must be material, he agreed with Plato that supreme forms are universal and thus ideal, and that it was Socrates who discovered this through his inquiries. The analogy that Socrates reaches in Plato’s Republic, further projected into the cosmos in Plato’s Timaeus, is an ideal form, cosmic in fact, that must be materially incarnated in an individual or city. For Aristotle, this is the pinnacle of thought, and his own work continues in its wake. Things can move in space, or change in quantity and quality. Quantity includes things such as number, size, or proportion, and quality includes things such as color, texture, or density. Potentiality is realized in actuality, driven by the four causes. If we are building something, the material we use is potentially a building, and the building is realized through our actions in the realization of our plan, the end and purpose of the activity. Disagreeing with Plato, Aristotle argued that universals, the general forms of things, must be incarnated in particular things at some time. The motions of the aetherial brings about the motions and forms of the elemental world below. The supreme substance for Aristotle was the Unmoved Mover, what many compare to God, the first substance which moves all things but does not itself move. Like Descartes did thousands of years later in France, Aristotle considered the soul and the heavenly bodies to be living substances, separate from the lower, baser substances, but still substantial. The Unmoved Mover is quite similar to Anaxagoras’ Nouswhich shakes all things by its thought. Aristotle criticized Anaxagoras for employing a ‘deus ex machina’, a charge that he believes his own theory escapes. God is an eternal, perfect being which does nothing but contemplate, its contemplations giving form to things just as the idea of a ruler gives form to a city or the idea of an artist gives form to clay. 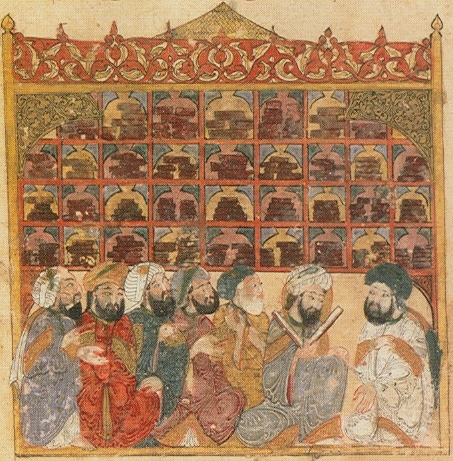 Aristotle’s physics and metaphysics were replaced by Newtonian physics, though challenged and improved by Islamic philosophers, logicians and scientists of the Islamic golden age (800 – 1300 CE). Aristotle was revered by Muslims, who saw him as a patriarch in their own cultural tradition, just as the Europeans do in theirs, often forgetting that the Muslims did so first.